The space shuttle Atlantis is seen via a camera mounted to the exterior of the International Space Station as it arrives on Nov. 18, 2009 during NASA's STS-129 mission to deliver much-needed spare parts. This story was updated at 1:38 p.m. EST. The space shuttle Atlantis and its crew of six arrived atthe International Space Station (ISS) Wednesday to drop off some massive spareparts for the orbiting laboratory. The two vehicles linked at 11:51 a.m. EST (1651 GMT) as thetwo spacecraft flew 220 miles (354 km) above Earth. After sealing the linkbetween them, astronauts opened the hatches at 1:29 p.m. EST (1829 GMT). "We're crashing the party," Atlantis commanderCharlie Hobaugh radioed to the waiting station crew when the shuttle wasabout a mile away. "We're looking forward to seeing you guys,"station astronaut Jeff Williams replied. Atlantis launchedMonday carrying more than 27,000 pounds (12,246 kg) of cargo for the spacestation, including a pair of massive carrier platforms laden with large spareparts for the orbiting laboratory. The spares, which include huge gyroscopes,pumps and other gear, will be installed at the station during three spacewalksplanned for the 11-day space mission. 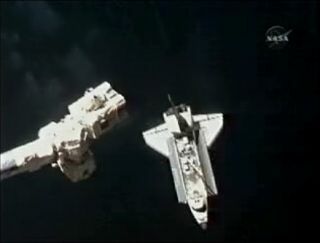 About an hour before docking, Hobaugh flew Atlantis througha back flip called the rendezvous pitch maneuver, which affords the station adetailed view of the shuttle's underbelly. Inside the ISS, NASA astronauts Williams and Nicole Stotttook several hundred photographs of the shuttle's heat shield to be beamed downto Mission Control so engineers can analyze them for any signs of damage theorbiter may have suffered during launch. The move is standard practice after the space shuttleColumbia was damaged in 2003, when foam fell from the shuttle's external tankduring launch and damaged the sensitive tiles on that orbiter's heat shield.The damage led to the devastating loss of the shuttle Columbia in 2003 and itsseven-astronaut crew. So far NASA has found no major cause for concern from firstreadings of data taken during anexhaustive scan of the shuttle's heat shield Tuesday using a sensor-tippedpole. Engineers will continue to pore over that data and the new photos to besure the shuttle is safe to ride back through Earth's atmosphere to the ground. "Preliminarily, we don't have any significantissues," said LeRoy Cain, head of Atlantis' mission management team, lateTuesday. After Atlantis' docked time at thestation ends Stott will return back home with the STS-129 crew. "I hear you have someone up there looking for a ridehome," Hobaugh said as Atlantis approached the station. Williams jokedthat Stott hadn't yet decided whether to stay in space or return to Earth. "Tell her we all bathed, we're okay," Hobaughsaid. Stott has been living aboard the station since late Augustas part of the outpost's six-person crew. She is currently the last astronautplanned to be rotated on and off the station using a NASA shuttle before thefleet is retired in the next year or so. Stott and her crewmates have been tackling some glitcheswith the station's systems. A 150-pound (68-kg) device used to distillastronaut urine into pure drinking water is broken and will have to bereturned to Earth on Atlantis. The station's water processing assembly is alsoexperiencing problems. Neither glitch is expected to pose any concern to Atlantis'week-long stay at the space station, Cain said. After reaching the station, the shuttle astronauts willbegin preparing for their mission's first spacewalk, set to take placeThursday. Veteran spacewalker Mike Foreman and first-time flyer Bobby Satcherplan to install a spare antenna and complete other station maintenance tasksduring the planned 6 1/2-hour activity. This evening the two astronauts will sleep inthe station's Quest airlock in a so-called "campout" to purge theirbodies of nitrogen to avoid developing the bends while working in theirspacesuits tomorrow.